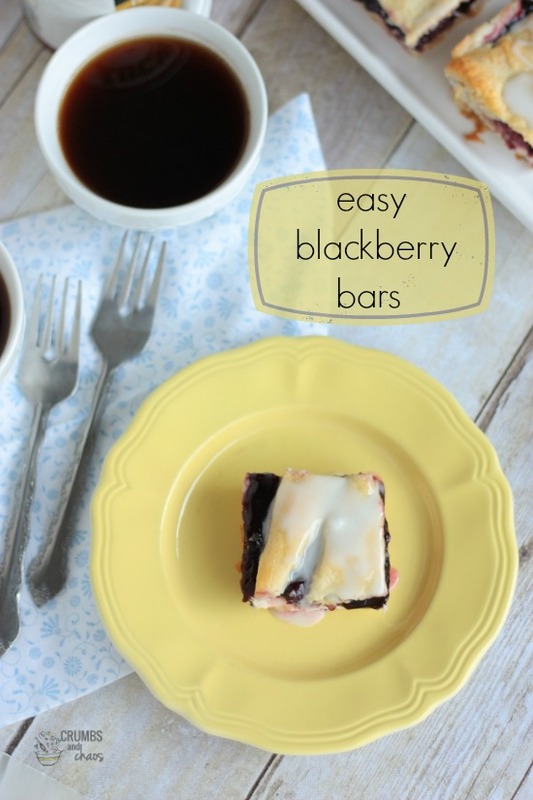 these Easy Blackberry Bars are perfect for your next potluck or picnic. I hope you’ve had a wonderful weekend so far. We attended a church potluck today and I wanted to take an easy dessert that I didn’t have to spend half the day yesterday making. I had better things to do…like watch a local BMX bike group wow my 6 year old with their stunts and scour thrift stores for food props (like my new-old yellow plates?) So I decided on blackberry bars that had minimum prep time and a quick 30 minutes in the oven. They were very well received and completely gone by the time lunch was over. 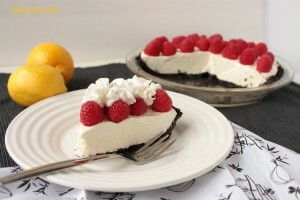 This is one of those desserts that you should print out and file it away for one of those days when you don’t have much time, but need a dessert that is simple yet impressive. 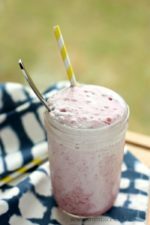 What I loved about this recipe? The crescent rolls made an fantastically easy crust and they were sturdy enough to hold all of the goodness in between. And the cream cheese layer?! Don’t get me started…there are few things better in life than sweetened cream cheese. 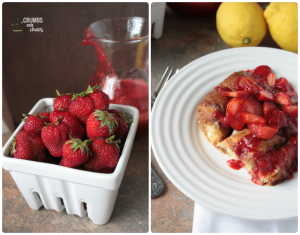 What you’re going to love about this recipe? 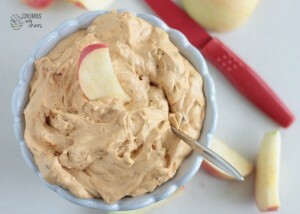 The fact that you could use your favorite pie filling to make it a dessert you really love. And probably the drizzle?! What’s not to love? Also, the fact that these could definitely be breakfast – delicious either way. 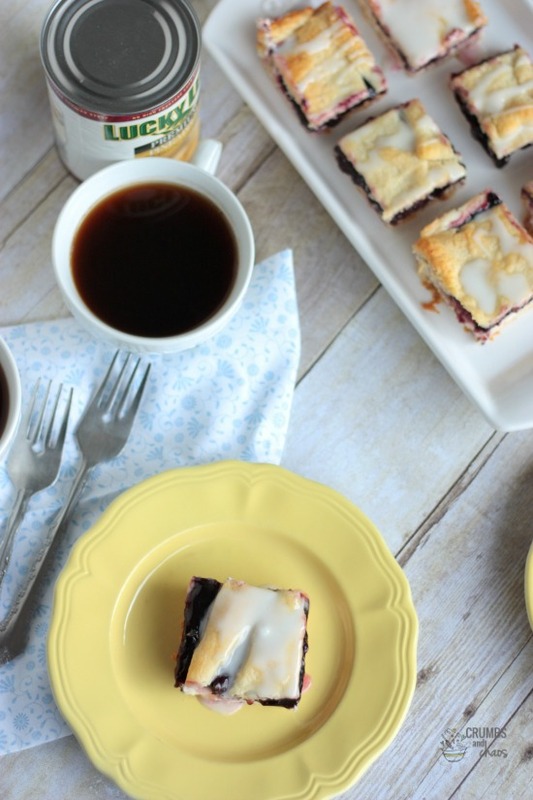 This simple recipe for Easy Blackberry Bars combines crescent roll dough, blackberry pie filling, a sweetened cream cheese layer and is topped with a sweet lemon drizzle. Place one can of crescent rolls in the bottom of a 9x13 pan. Press seams together to form a crust. Beat together cream cheese, vanilla, sugar and egg yolk. Spread evenly over the crust. Top with pie filling. Open remaining crescent rolls. Press two dough triangles together at the seams and place on top of 1/4 of the pie filling layer. Repeat with remaining dough, the pie filling will be mostly covered. Bake for 30 minutes until golden brown. Cool completely before glazing. 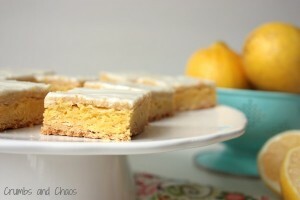 Mix together powdered sugar and lemon juice. Drizzle over cooled bars. These bars look really delicious! 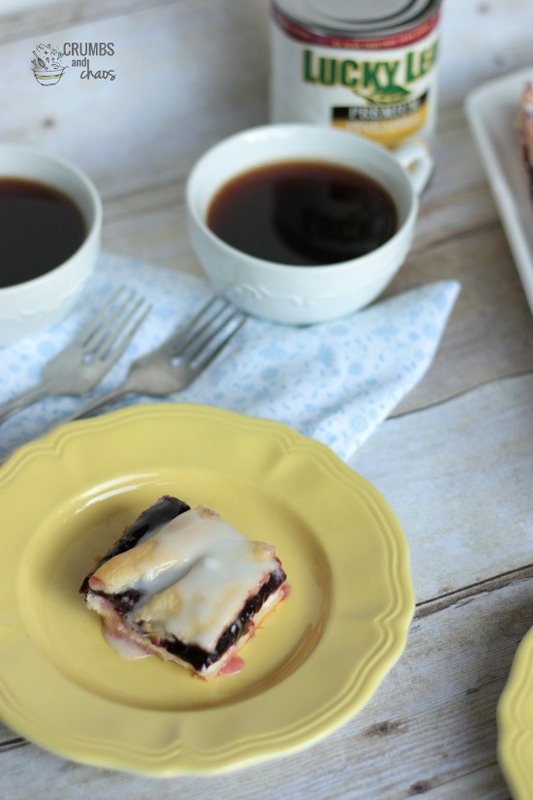 I love blackberries, and cream cheese??!…perfect! I’ll have to try this recipe out! I love these!! So easy, and versatile too! This sounds like a delicious recipe! And quick and easy.. what more could we ask for! I wish I had these for breakfast right now! I love treating myself to something sweet for breakfast during the week. 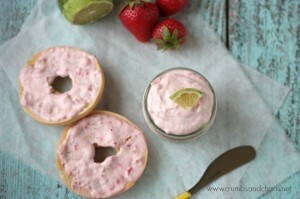 And these look so super easy and yummy. Sold!